Create a CLEAN UP ZONE Create a DISPLAY ZONE . . Roll Outs and Pull Outs. . . . . Drawers . . . . . . . . . . . . . . . . . . Lazy Susans . . . . . . . . . . . . . . Pantries . . . . . . . . . . . . . . . . . . Lift Ups and Tip Ups . . . . . . . Islands . . . . . . . . . . . . . . . . . . . 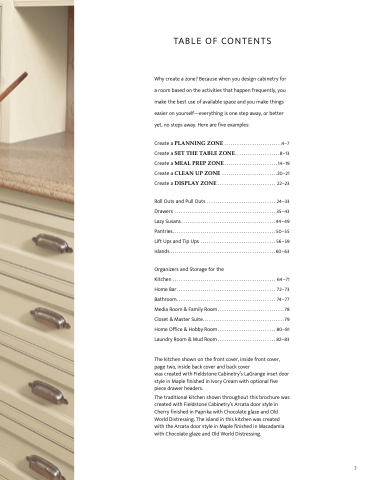 The kitchen shown on the front cover, page one, inside back cover and back cover was created with Fieldstone Cabinetry’s Waterway door style in Cherry finished in Driftwood with Chocolate glaze and the Waterway door style in Cherry finished in Hazelnut. Cherry finished in Paprika with Chocolate glaze and Old World Distressing. The island in this kitchen was created with the Arcata door style in Maple finished in Macadamia with Chocolate glaze and Old World Distressing.